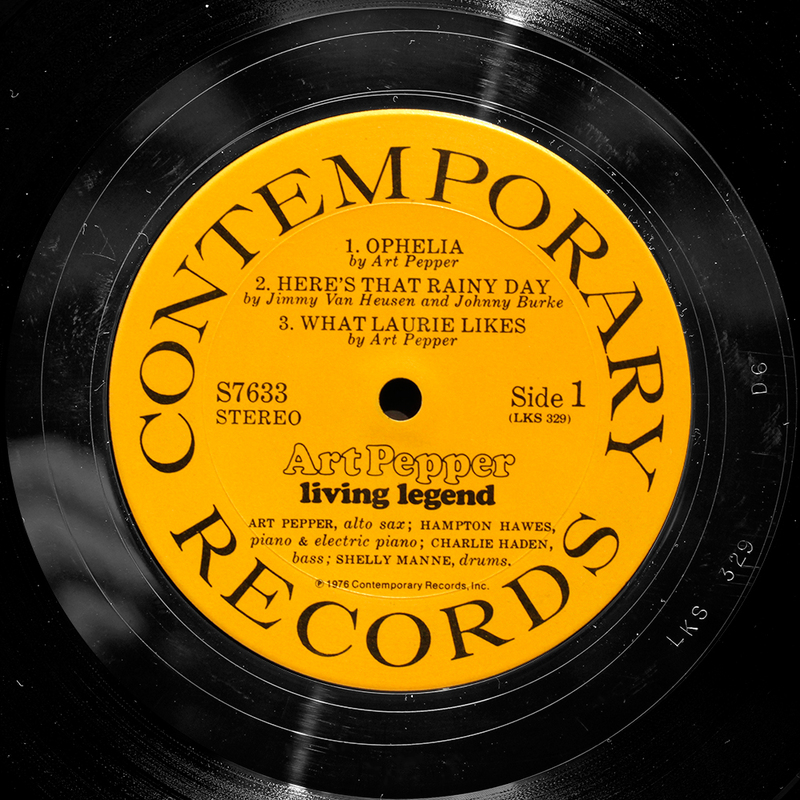 Contemporary recordings were reissued many times over several decades. 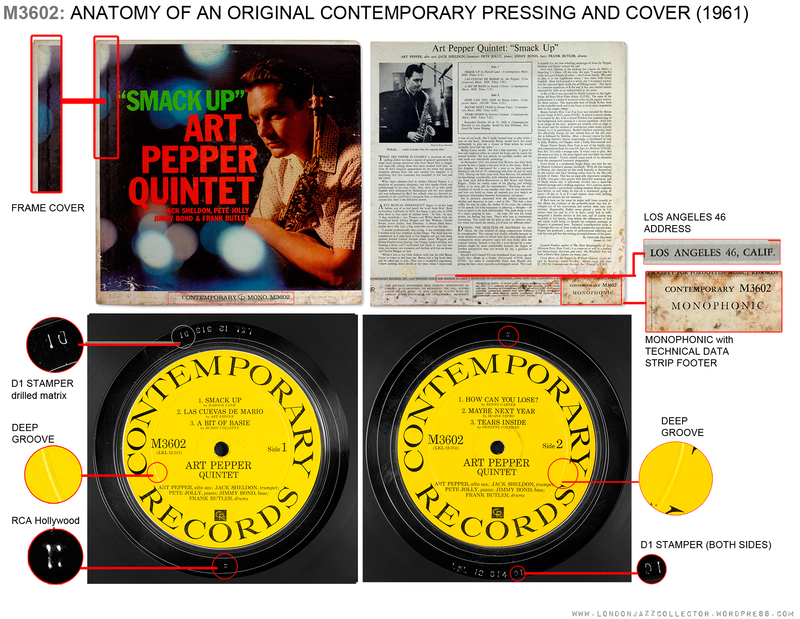 This guide is intended to help distinguish original pressings from second and later reissues. Contemporary always provide the date of the original recording session, and the year of copyright assertion, but nothing regarding date of manufacture (save for a very few titles at the end of the ’60s and early ’70s). The absence of year of manufacture often leads to the use of the copyright date from the liner notes e.g. ©1959 in Discogs entries. The year of copyright © remained constant through decades of re-issues and does not indicate year of manufacture. “Inc.” or without “Inc.” in company name. The first 12″ series, which took over from the 10″ C2500 series of early – mid ’50s. These are invariably deep groove and mono, moderately heavy vinyl in the region of 150-160gm. First issues of the first 40 or so titles in C3500 series often had coloured frames around track-listing and coloured text titles on the liner notes. Stereo Records imprint, black glossy label with gold text , LKS D1 stamper code both sides, H stamp (RCA Hollywood press), deep groove, weight 141 gm. 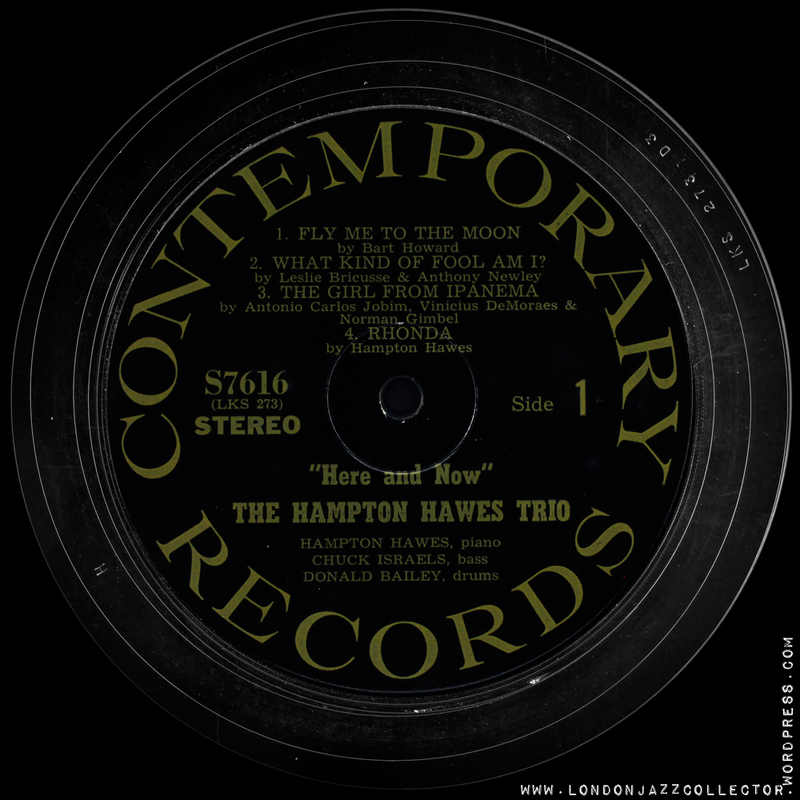 In 1958 Contemporary founded a new company for publishing the “new” stereo technology records- whose cover bears the distinctive addition of the word “STEREO” on a white oval, and its own label, Stereo Records. Though the thirty-odd titles released on the S7000 Stereo Records series are all found with black/gold text, some issues are seen with green marbled glossy label, shown below. These seem to be only towards the end of the series, before stereo publishing reverted to the Contemporary Records label in the S7500 series. 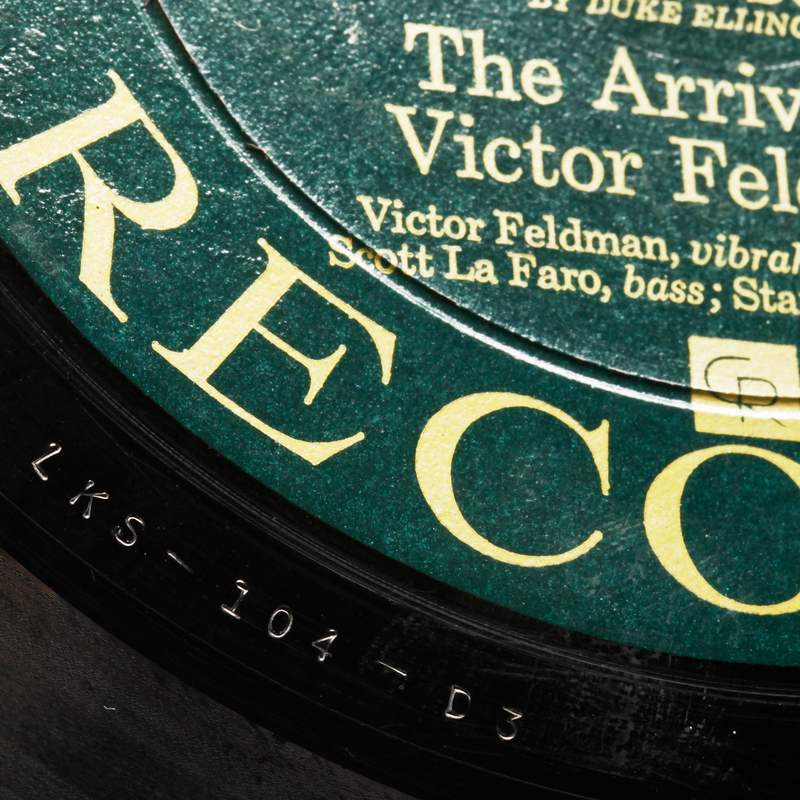 The deep groove points to a pre-1960 origin. Stereo Record was officially dissolved in 1963 though it is likely Contemporary ceased to use that name beyond 1960, publishing stereo in its’ own name in the S7500 series. “In the early 1950’s they were using Capitol’s Melrose Studio to cut “Contemporary” records. When Capitol switched over to the Tower Studio in July of 1956, Contemporary didn’t follow over there. Instead they bought their own Ampex 350-2 portable tape recorder and started recording in the back storeroom of the Contemporary/Good Time Jazz offices. The two engineers, Howard Holzer and Roy DuNann, just set up their three or four microphones and let her rip, live to two track. They also had a mono machine going for the mono feed. “At that time the idea of “binaural” sound meant (to them) a very obvious left/right deal, with nothing in the middle. They actually had not heard any stereo recordings before they started recording in the medium so they just guessed that it was the correct way to do it. The reason they did a binaural recording at all was because of the open reel audiophile tape market. This had nothing to do with stereo LP’s which didn’t come along until 1958. Of course when stereo records were finally perfected, Contemporary found that their backlog of stereo master tapes could be utilized. As Contemporary commenced publishing Stereo titles under its own name in the early ’60s it re-designated the original yellow C3500 series as the M3500 series ( M for monophonic) and commenced a new S7500 series (S for Stereophonic”) adopting the same black label gold text design used by Stereo Records. The black/gold DG are the 1st issue original release, however all three colours were used arbitrarily among later reissues, so other factors are necessary to corroborate early status. Green/Gold label above , LKS machine stamp matrix code and D second stamper set, probably early to mid ’60s “deep groove”. Note: with Contemporary Records, the catalogue number is never present on the matrix or on the runout – only the matrix code, typically LKS or LKL and two or three digits, and then what looks like a code for the mother and or the stamper. The original metal matrix has a sequential number each side eg LKS 69 on one side, LKS 70 on the other. The Catalogue number is found only on the label, and of course is the same each side. Below the RCA Hollywood stamp, which endures even with early 70’s reissues. Around the time of the S7500 series catalogue number reached S7600, though black/gold, this label is later, no longer has a box around the word “STEREO” and the artist name/album title is no longer in the classic serif font, but heavy more “funky” font, late ’60s possibly through to early ’70s. 5 Contemporary S7500 series, Yellow/black , CR logo, STEREO boxed, no DG. 6. 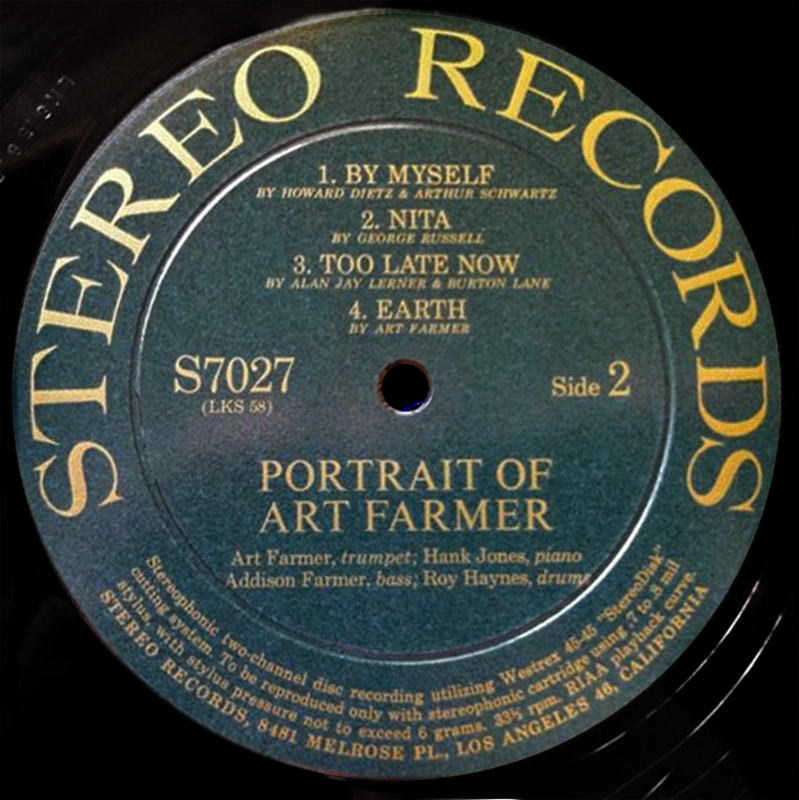 ’70s to early ’80s, last label in use before sale of Contemporary Records Inc.to Fantasy Records in 1984. “Funky fonts” start to appear. With the closure of RCA’s Hollywood pressing plant in 1976, metalware and pressing of Contemporary Records moved to Monarch Record Mfg, Los Angeles. Monarch pressed singles by the million, and the Contemporary LP requirements were fairly insignificant by comparison. Though in some cases Monarch pressed with stampers derived from original LKS masters, some of their output shows signs of remastering, adding their own factory control processes. In addition to LKS recording number and mother/stamper code, job codes are hand etched, with a delta symbol prefix and a long number. Hand-etched matrix codes replace those associated with RCA Hollywood stamped matrix. The Monarch logo, a circle around letters M and R which share the same stem, appears in the run-out, often hardly visible. 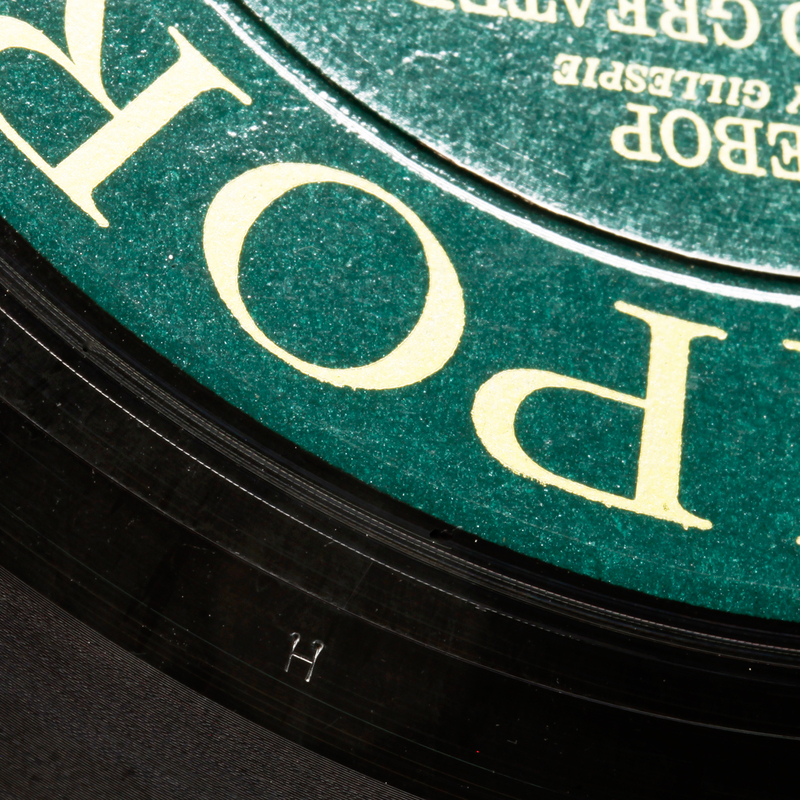 Vinyl can be wafer thin, as little as 105 grams. With new releases during the Monarch era, it looks like the association with Du Nann and Holzer ended and mastering moved to Sheffield Lab Matrix (SLM) and Master Studios. 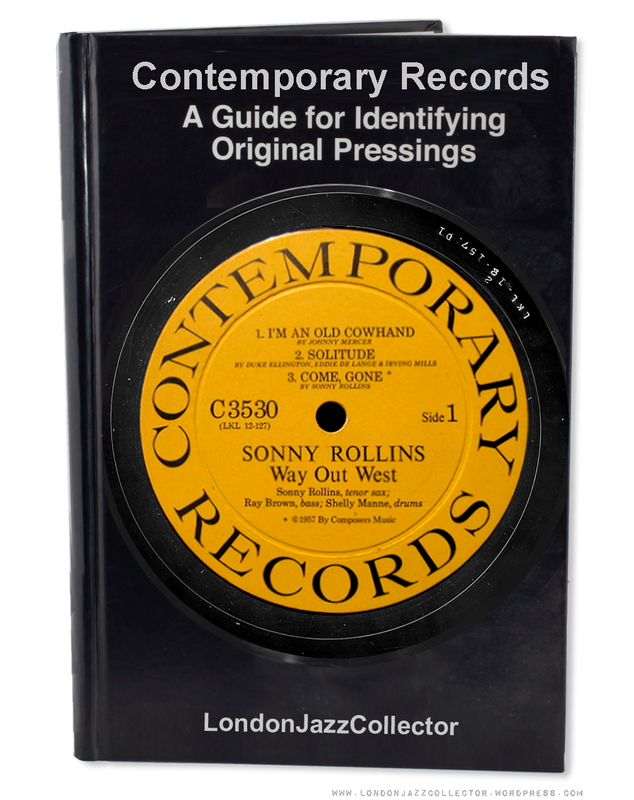 A new catalogue 14000 series managed a few dozen new titles for Contemporary under the aegis of Lester’s son John, showcasing a few leading lights of the ’60s taking time out from their fusion duties. Nice recordings, and sonically quite acceptable, though some of the players (Richard Davis, Anthony Williams) were no longer in the same place, a decade of amplified stadium concerts taking its toll. Corea however is on good form, acoustic piano far removed from the interminable synth-noodling and squawking that followed. It’s a little strange because it was from a jazz collection that was just in and had a lot of mainly 50’s, 60’s and 70’s genuine pressings and the entire collection looked like it hadn’t been updated since the early 80’s. If the record has a machine stamped matrix in the deadwax and a light ring where a deep-groove would be, like the one in the discogs link, that indicates a ’70s pressing (most likely Monarch, small MR in the deadwax) which should sound excellent. It has the machine stamp and the light ring but no MR. The vinyl looks and feels like typical 70’s vinyl, so I guess I just got confused by the cover. Sounds excellent by the way! I just picked up a copy of Jimmy Woods Awakening S7605 and noticed what appears to be an anomaly with the D stamper I was hoping you could shed some light on. My copy is stereo, black/gold label, deep groove, CR, Los Angeles 46 on back cover, LKS 241 D2 on side 1 in run off, LKS 241 D1 on side 2 in run off. Any idea what pressing this may be? What’s the anomaly? If it’s the D1 on one side and D2 on the other, there is nothing unusual about that. It is common for one side to be one iteration greater than the other ie D1 and D2 D2 and D3, D3 and D4 etcetera. However it also happens sometimes that they are the same both sides. Why or how this happens I have no idea. So is mine a 2nd press due to the presence of the D2? Do both sides need to be D1 to be a first press? One would have to have bought a lot of copies of the same record to be able to answer that question. Why would any sane person do that? That is why a lot of this stuff is uncertain. Records that were not especially popular, not pressed in any quantity, rarely repressed, then D1 both sides is mostly all you get. No-one has any idea of the quantity of sales of each title. Lovely to know but no-one does. Sometimes you see the obvious repress with D2 where other corroborating detail confirms it was a later reissue. Or D3. 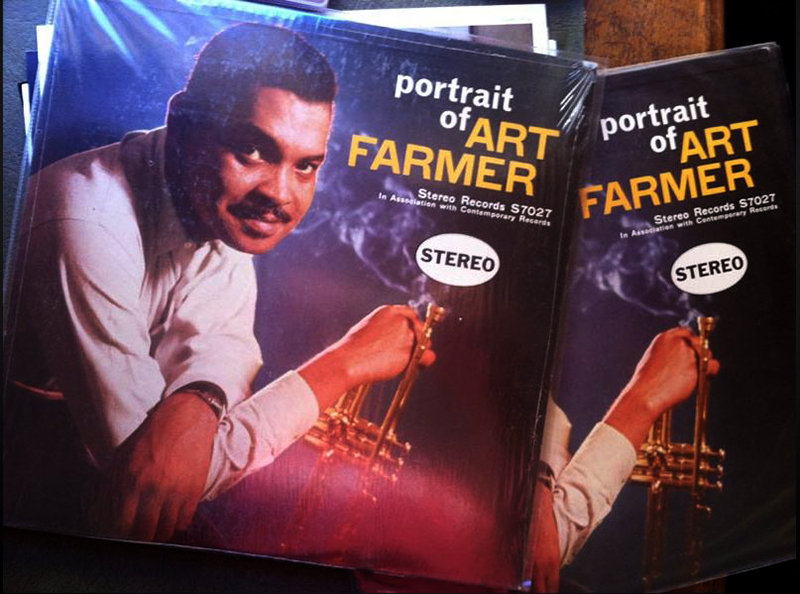 Records that sold in huge quantities, Art Pepper, the D numbers tell their own story. D whatever, multiple repressings and incremented stamper codes. I can’t answer your question, because truthfully, I don’t know, and I don’t think anyone else does. We are doing well with what little we do know. Hi there. I have a copy of Way Out West LP (M 3530) with frame cover, with “CR” far bottom right, next to a black box with “Contemporary – Produced By Contemporary Records Inc.
Back address has Inc at the end, even though it has a frame cover. Heading on back is black, not red. Record is deep groove, but has D4 stampers, and the label has the copyright symbol with 1957 By Composers Music. I’m assuming this is a mid to late pressing, but not entirely sure. The sound is bright, with no flaws whatsoever on playback, so i’m a bit suspicious that it sounds this good for being that old supposedly. Definitely not heavy vinyl either. Any insights you can offer would be greatly appreciated. Thanks, Mike. 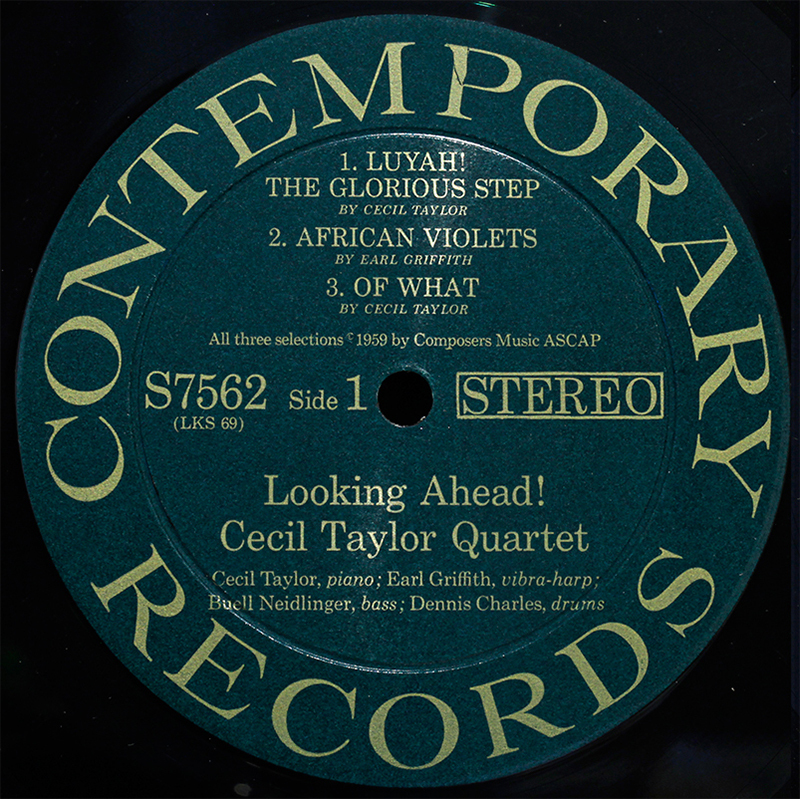 the first M 35xx series appeared with M 3562 (Cecil Taylor). We are in 1959. I have the same one (M 3530 – frame cover – black box – CR) as you with a D4 stamper. In fact this one is the first re-packaging of this album. When I compare this one with my “original” D1 stamper issues, there is no sound difference whatsoever. I have always kept this issue as a very valuable, authentic alternate issue. CR vinyl was never heavy vinyl, just average. Thanks again for your valuable insight Rudolf. I should have expected that if anyone was going to know it would have been you. Based on your advice, the “D4” copy that you and I have is still a valuable keeper, and to that end, i won’t be letting go of it, just keeping an eye out for a reasonably priced D1 first pressing. I came across this item on a US based site “939 Records”, which offers a M 3530 copy for $ 1000. I believe the M 3530 version is quite rare, since at the same time they were ending the Stereo Records “division” and integrating it into Contemporary proper, whereupon 3530 became a stereo only issue (7530). So the effective period in which M 3530 copies were issued is a relatively short one. Hi Rudolf, I’ve just managed to secure a very nice copy of the 1st C3530 pressing. Sonny Rollins written in Red on the back with the red square. Will it have D1 stampers though? I will have to wait unit I receive it. 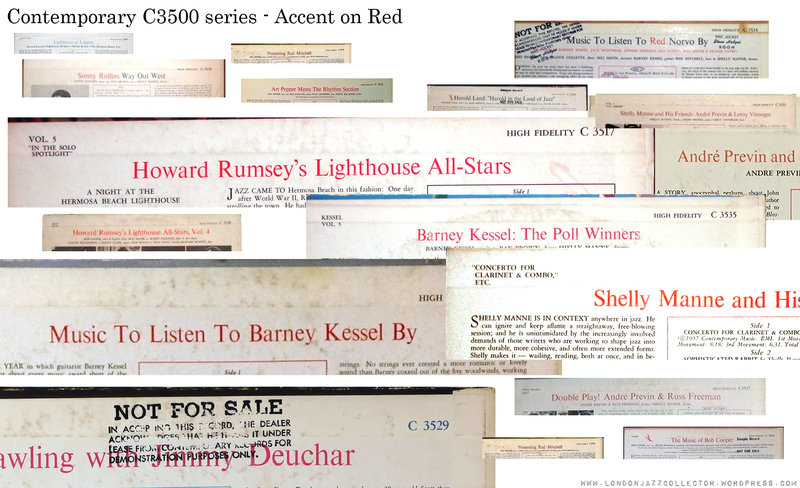 That’s interesting 939 Records offering M3530 for $1000! Maybe it will become quite sort after, after all. Perhaps the CR equivalent of NY23! I’ll report back once I receive the record. Congrats! Please keep me posted. I checked the stampers however, and they are D2, not D1 as I had hoped. I’m not disappointed though, as I purchased this for a steal, timing was everything! Great! Re D2, it only seems logical that it is not D1, since it is a second issue, which is often found in D4. 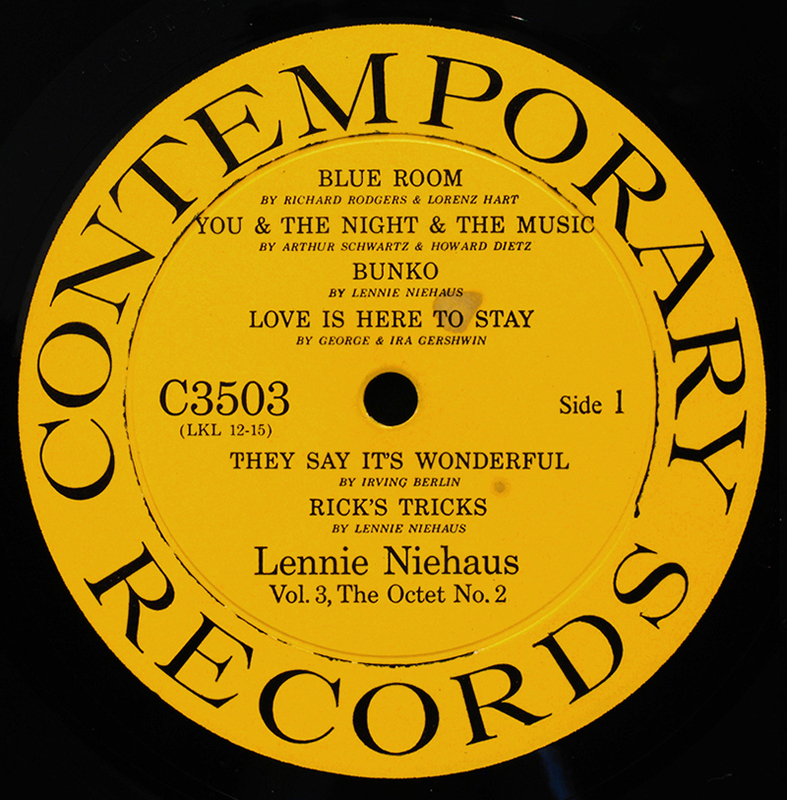 there is another inner sleeve that runs up to m3602 smack up with blue and black printing. the address is la 69 and the copyright info printed on the sleeve indicates that it was printed some time 1961 or later. The bottom line is are we to assume anything with the LKL or LKS stamp is some era of original pre fantasy original Contemporary pressing? That is my belief, yes. The clone-makers have never have access to original master tapes, or metal-ware derived from the master acetate. Hand-etched references to the catalogue number or matrix code is a signature of cloning. I guess they figured most people wouldn’t know any better. 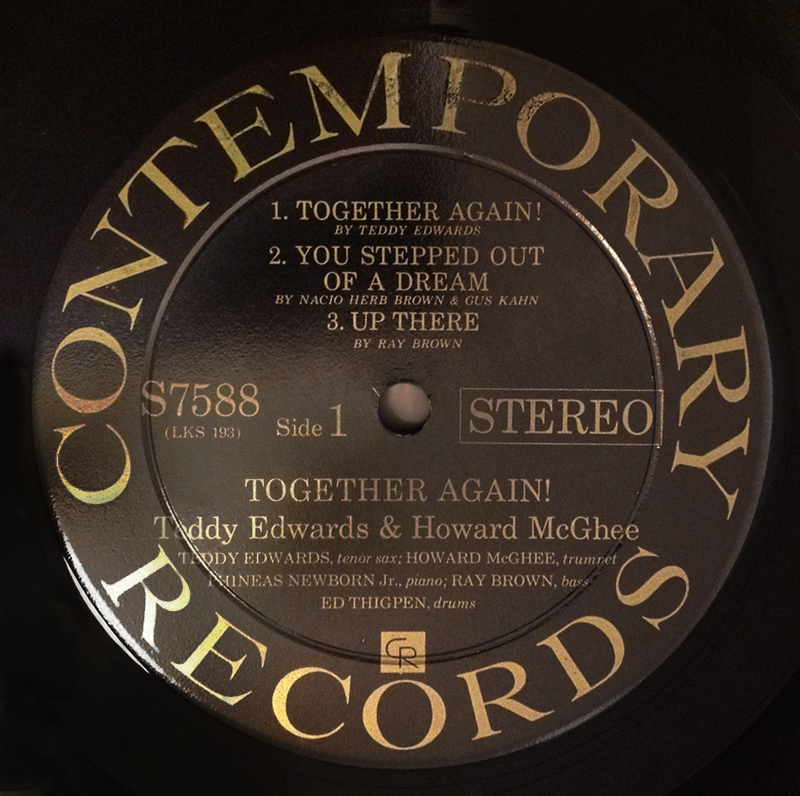 Contemporary did reissue earlier recordings themselves in the ’70s, but I guess they had access to original sources. “Genuine reissues” is a grey area. Where does the label with the ‘CR’ inside of the ‘O’ in RECORDS fit within this timeframe? Art Pepper’s “+Eleven” for example. Does anyone know which inner sleeve is earlier, the one with the blue printing or the red/pink printing? The answer to this is lurking around Jazzcollector.com somewhere. I’ve seen it but I forget. 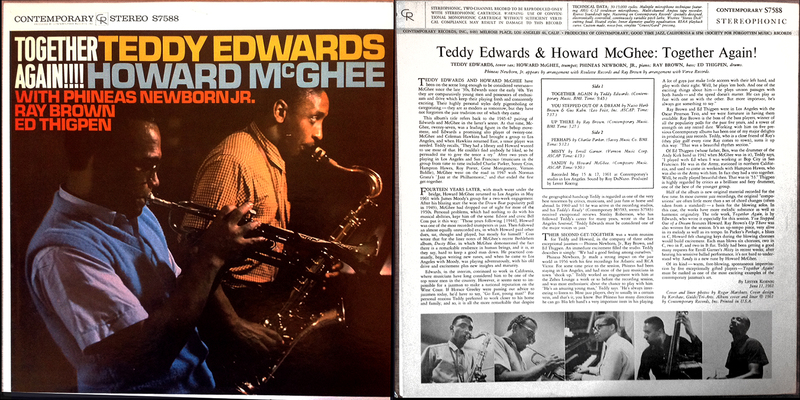 Either way, both sleeves are later than the earliest Contemporary pressings, which had no inner sleeves. you are right, earliest CR without sleeves. Thereafter came a blank sleeve without print, then a blue print (early version – I cannot describe without pictures) and the last version inner came in the red or blue print, same model both, of which the blue one seems the earlier. can anyone tell me if the color of the top line on the back cover (Red, Blue, black) says anything about the originality of the copy? The backs with colors are supposed to be earlier, as opposed to LPs with backs that only have black ink. I’m not especially knowledgeable other than trawling the internet for wasted hours, but as far as I can see, not all albums were given the coloured text and frame treatment by Contemporary. I reckon more than half of the titles in the C3500 series I have researched turn up only ever with black text. Not to say coloured text/frame don’t exist, but if our friends in Tokyo don’t turn one up its a safe bet it doesn’t exist. Some – very few actually – are found in two different liveries (the Pepper and the Rollins), others are just one coloured text frame 1st , and black text later. After C3544 there are almost no coloured text/frame covers, as though the design idea had run it’s course. There seem to be several themes in the Contemporary designers mind. Initially they picked colours for text and frame that featured in the front cover. Perhaps that became too onerous, and they quickly defaulted to red (Red Mitchell, Red Norvo etc) many many red, unless there was a special angle. Inexplicably, a Curtis Counce is Purple. Why? Fascinating, viewed from a distance. I knew none of this before, because we Brits bought our Contemporary through the very excellent Contemporary Vogue pressings, from Decca. in the early issues two-tone backs were the majority. The original 3506 with the blue print in front however, came with 100% black print on the rear. The re-issue with the young lady came with red print on the rear, though nothing in red on the front. A random choice? 3509 has two colours in front (blue and green), you will find them back on the rear for a rare three-tone cover, the only one with the renegade Pepper. A notorious example of an all blackink rear: 3526. My C 3506 (Lyle Murphy) has red printed titel on front and red “Lyle Murphy” on the backside. My C3501 has a pale pink on back instead the yellow back shown in the back cover survey and C 3517 has red print on backside. Just to mention a few more. Willie: you may be right regarding the re-issue of 3506, after all it may have red in front. It is a long time ago I sold it. Re your 3501 and 3517: ditto on mine. On Art Pepper Meets the Rhythm Section the heading on the back slick should be blue and have a pink line around the tracks to be a 1st art cover. The cover should also be framed. Way Out West on the other hand should have a red heading and the cover should be framed. I’ve verified this with 2 of the best and most knowledgeable dealers in the world. It appears that you’re missing a 60s yellow label with CR logo from Contemporary. I’ve got a few of these and was confused because they aren’t included in your label guide. See this link for photo http://www.vinylbeat.com/cgibin/labelfocus.cgilabel=CONTEMPORARY&label_section=A,B,C the label that’s labelled Contemporary 3 appears to be missing from your guide. Yellow label with CR logo, no DG, but LKS in dead wax. At least on my Sonny Rollins and Contemporary Leaders. your link is not active. Is the vinyl heavy? Thanks you. Perhaps the mixed parentage LP’s indicate a shift from LKS to SLM pressings? I live near one of the best jazz shops in the States and will try to do a little research on this one. Apparently there are also variants within the later (current) OJC pressings: some pressed with digital masters some pressed with “audiophile” analogue hardware from DCC and / or Analogue Productions reissues. Re: the clones – if they have SLM hand etched in the runout it means the lacquers were plated at Sheffield Labs Matrix, an LP metal company in the US which was around in the 70’s (possibly even the late 60’s) through the late 80’s. As such, I would guess these pressings date back at least 25 years, probably much older as Fantasy would have pressed these in the OJC series starting in the early 80’s. The SLM copies I have have jackets with glued on backs as well, something that went out of style long before the hideous run of current cloned Scorpio’s. So, not sure what the provenance of these masters might be… Would be curious to see if your 1976 original pressings also have the SLM etchings. Your word is my command – updated the page section 5 – Modern US Contemporary – with a better photo to illustrate the matrix codes in situ using my new “helicopter view” of label and run-out together. Cool, no? Sorry, no SLM etching on this one, just pure factory LKS stamp . Joe, The Department and the Mayor want you to know they really appreciate all the hard work you have put in to this case. I think its time you took a well-deserved break, Detective. Take some time off, relax, play a little golf, perhaps take your good lady for a long weekend in Acapulco, we’ll be taking over the Contemporary investigation from here on. Just one thing – you say machine stamp AND copy-shop engravings? Sheesh, have you been smokin’ something? I just picked up Way Out West in stereo, with that late 60 s yellow label as well as JUST machine stamping in the deadwax (I’ll double check later, but I’m 99% sure there’s nothing else). 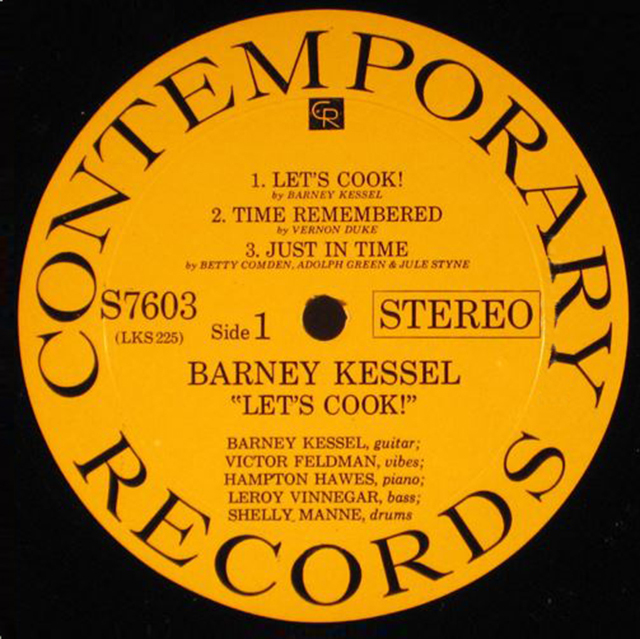 The cover also has “CONTEMPORARY RECORDS” in small font on the top right corner of the cover with that black square logo. Very light vinyl. I assume its a 70s original and not anything like an OJC…it would be cool if it were a 60s pressing but who knows? the sixties stereo pressings still had black labels, thereafter came green labels and then only the yellow ones you refer to. Must be late seventies, early eighties. The small letter type top right cover is a good indicator. I had the same bought directly from CR late seventies. Thin vinyl, also the sleeve is less sturdy than the originals. Looks like that’s what I have then. Thanks. I do still like the sound on this LP even though its a newer press…quiet vinyl for a quiet session…and Sonny is still more powerful and live than he is on CD. I do wish I had a nice heavy jacket for this one though…hilarious photo.